"This reign of terror must stop", says new envoy. "Only cessation of incitement will alleviate this dangerous situation." "A wave of terror continues to spread across the nation and it spares no one – babies, children, men and women are being targeted every day. Israelis do not feel safe walking down the street; they avoid taking the bus to work, and they fear for the lives of their children every time they walk out the door," he said. "This reign of terror must stop. Only the cessation of the incitement will alleviate this dangerous situation and bring calm and security to the region." 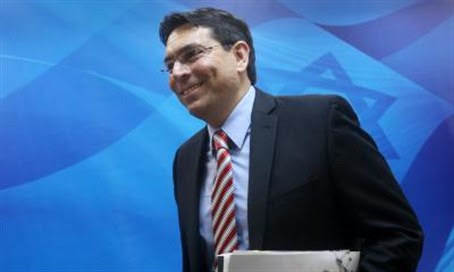 Danon noted that in 72 hours alone, 12 horrendous terror attacks took place, and that over the course of this month, 24 attacks against Israelis claimed the lives of 8 and injured 56 people. "On Monday, in a particularly shocking and horrific attack, two Palestinian teenagers, one of them merely 13 years old, stabbed a 13-year-old boy riding his bicycle and an Israeli man who was walking down the street. This was just one of the four attacks that took place on that day alone, three of which were carried out by minors." Ambassador Danon added: "Such acts of pitiless slaughter do not occur in a vacuum. They are a direct result of Palestinian incitement, deliberately directed to inflame Palestinian children’s minds with hate, and are a result of the propagation of false allegations against Israel, in particular regarding the status quo on the Temple Mount. As Israeli Prime Minister Netanyahu clearly stated time and again – Israel is fully committed to maintaining the status quo on the Temple Mount."